← Too Hot for A Campfire? Try S’mores Bars! My husband Kurt and mom LOVE hummus, and I make it at home for many reasons, e.g., it’s easy to do (if you have a food processor) and cheaper than buying it– even at Costco. 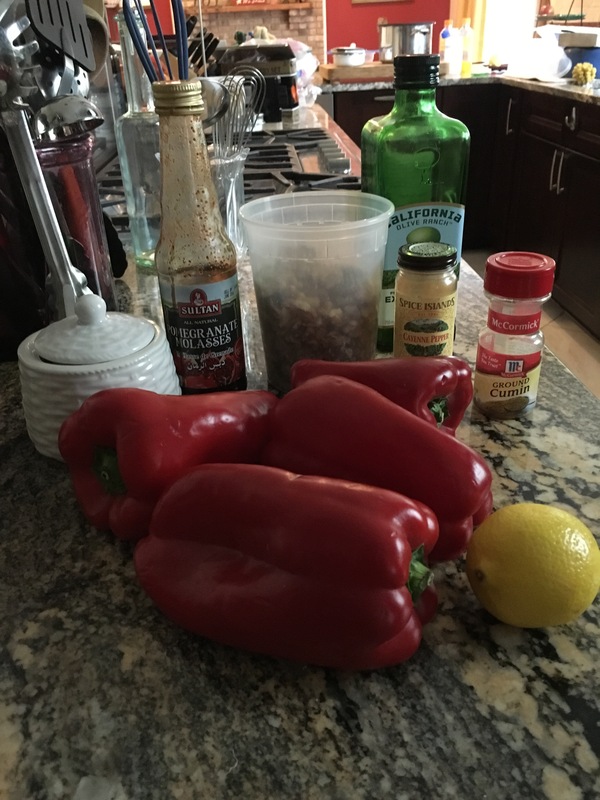 If you’ve never made your own hummus, check out my post here. Having mastered Italian cuisine, Kurt has been dabbling with Middle Eastern fare; he has several cookbooks either purchased on his own or gifts from friends and family. He likes to sit in our family room while I’m cooking and call out recipes that he’d like to try. 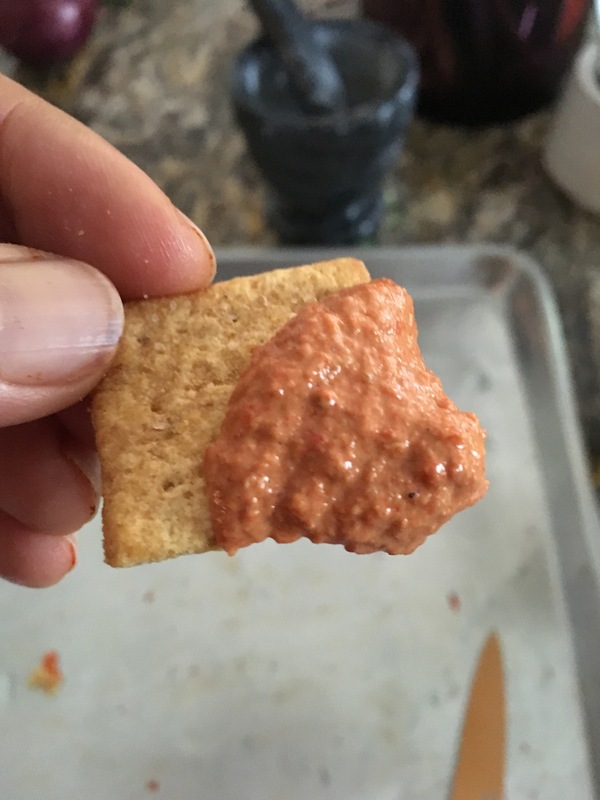 This is one of them– a sweet and slightly spicy dip made from roasted red peppers and walnuts.. It’s called muhammara and has its origins in Aleppo, Syria. I served it as an appetizer with pita bread and wheat thins for my mommy dinner in the spring and they raved! I am finally getting around to posting the recipe for them so they can try it at home. Make this a day ahead so the flavors can snuggle up. Serve with pita bread or chips, and of course, leftover Wheat Thins! Here’s what you need…almost. I forgot the Wheat Thins! Get your broiler going and place the peppers on a rimmed baking sheet. Broil, turning peppers as they blacken until all sides are charred. (Don’t freak out over the smell of burning food; the skins need to blacken so you can peel the peppers). Place the peppers in a zip lock bag and seal. They need at least 10 minutes; I usually wait until they are completely cooled down. Plop the peppers in a bag. While the peppers are cooling, place the walnuts, salt, sugar, cumin and cayenne into the bowl of your food processor. Add the wheat thins, lemon juice and pomegranate molasses and pulse until you have a paste. When peeling the peppers, be aware they are pretty slippery with their natural oils. Peel off as much skin as possible– there will be some parts where the skin did not roast, just try to remove what you can). Remove the seeds and membranes, then roughly chop the peppers. Add the chopped peppers to the walnut-Wheat Thin paste and process briefly. Measure the olive oil into a small bowl. With motor running, add the olive oil, and process a few seconds. The dip will be thick and glistening! Enjoy on pita bread,pita chips, or plain ol’ wheat thins!